Pups are raised in a loving home with toddlers. Ideal for a show dog. family pet or guard dog on a farm. They are extremely intelligent and protective.Puppies are bred for their gentle temperament and stunning personality and will make an exceptional addition to your family and already been potty trained. 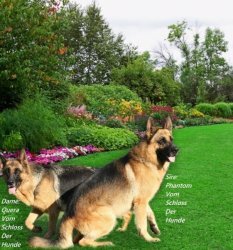 From imported bloodlines, Both parents are registered with the German Shepherd Dog Federation and awarded "V"- excellent in the show ring. Puppies are dewormed five times, inoculated 3 times and Vet checked. They are also registered with the German Shepherd Dog Federation. Puppies will be ready for their new homes in August. Deliveries can be organised by the owner. For more information please contact Alicia Jonck. Please book your puppy now to avoid disappointment.